Adrian Miller: My name is Adrian Miller. My latest book is the President's Kitchen Cabinet. The Story Of The African Americans Who Have Fed Our First Families From The Washingtons To The Obamas. Suzy Chase: You wrote when you want a personal connection to our Presidents and First Families and we believe that food, what Presidents like to eat or refuse to eat, what they serve their guests, and what they cook can be a leading indicator of Presidential character. Talk about how savvy Presidents use food to show that they're regular everyday people. Adrian Miller: Yeah, so a lot of Presidents have realized that if they are likable by the American public, it helps advance their political agenda. So I think President Obama is a great example because when he would travel, he would often do impromptu stops at burger joints, rib shacks, he loved drinking beer. That's a very relatable thing for a lot of the American public. You know if he was drinking a lot of wine, I think people would be a little suspicious and think that he was aristocratic. Another President who did this well I thought was Reagan by letting people know that he loved jelly beans. And I think Lyndon Johnson was another good example, his love of Southern food and Southwestern food and he was unabashed about praising Texas chili to the whole world. And then FDR, FDR really loved to be with the people, and there are a lot of pictures of him just eating hotdogs or just other kind of very on the street level kind of foods with other people. It shows that they have the common touch. Suzy Chase: The book kicks off with a list of African Americans by Administration who had a hand in Presidential food preparation. A couple of things that jumped out at me for example was John Adams had one African American staff member. Eisenhower had 15, and Lyndon Johnson had 31. Did the size of the staff say anything about that particular President? Adrian Miller: That is really a function of what was available through my research. So it just so happens that the Eisenhower Administration and the Johnson Administration were very good at keeping records of who worked where in the White House. So the staff is pretty much the same after, for the modern Presidencies in the White House kitchen itself anywhere from five to seven people and typically the staff would be the White House Executive Chef, the Pastry Chef and maybe the pastry chef would have an Assistant Pastry Chef. And then there would be anywhere from three to five additional people who are staff cooks, we call them Assistant Chefs now and they're a lot of cooks on loan from the U.S. Navy who cook in the White House kitchen. And so obviously Presidents that had a long tenure would probably have more cooks working for them. But the early years it's, are a lot of a mystery because there were a couple of fires in the White House over time and a lot of records got destroyed. So it really just depended what I found in secondary sources, in primary sources from the Presidential Libraries. Suzy Chase: Starting off with George Washington, his enslaved family cook was named Hercules. Tell us a little bit about him. Adrian Miller: Yes, so Hercules gets purchased as a young man. He's a teenager. And he was actually a boat ferryman but then he, Washington decided to have him made into a cook. So he starts cooking in the Mount Vernon kitchen and he apprentices under a long time enslaved cook named Old Dog. So he learns to cook and then when Washington becomes President and the Executive Residence moves to Philadelphia, Washington at first hired a white woman named Mrs. Reed to do the cooking, but I guess her food was straight nasty because she didn't even last six months. So he has Hercules come up from Mount Vernon and installs him as the Executive Chef there in the Executive Residence. The only problem was is that Philadelphia had, Pennsylvania, excuse me had something called The Gradual Abolition Act of 1780, which meant that if you were an enslaved person on Pennsylvania soil for six months or longer, you were automatically free. And so what Washington did to get around this is that just about the time the six month deadline would toll, he would pack up all of his enslaved people working for him in Philadelphia and send them back to Mount Vernon, leave them there for a couple weeks and then bring them back to start the clock over again. Suzy Chase: Talk about when Hercules left. Adrian Miller: Yes, so towards the end of Washington's second term. You know he was about to retire fully to Mount Vernon, he suspected that Hercules was trying to escape. And the reason he suspected Hercules is that, Hercules's son Richmond who was an assistant cook in the residence was caught with a bunch of money, and it was thought that would finance an escape attempt. Now when confronted by this by Washington, Hercules was like, "Oh, no I would never do that. I can't even believe you would even accuse me of that." But as punishment, Washington sends him back to Mount Vernon but not to the kitchen, but to the fields where he's doing hard labor. So this world renowned chef is suddenly making bricks, and clearing brush, and clearing crops and all that kind of stuff. So on Washington's 65th birthday Hercules escapes and I think it was very shrewd on his part because he knew there would be a lot of birthday festivities being planned, and so people would be distracted. So it's thought that he first goes to Philadelphia and then he maybe went overseas. And the only clues we have of a possible overseas trip is that there's a painting of Hercules, who is believed to be Hercules, sitting in a museum in Madrid Spain. And the painting is titled, A Cook for George Washington, painted by Gilbert Stuart. And the clothing of the African American in that portrait is the clothing of a European chef at that time, not what an American chef would have worn. But we really just don't know what happens because Washington was a very vindictive person. And Hercules knew the great lengths that Washington would go to, to retrieve enslaved people who had escaped through trickery, force, and other things. So Hercules knew that if he was going to make the mad dash he would have to really just disappear. Suzy Chase: I don't know why but I was surprised to read in your book that Washington had a really bad temper. He looks so mellow in all of his portraits. It's so funny. Adrian Miller: Yes he does. He does. He looks like a serene presence. But yeah, I read that in the work of a noted scholar named Thomas Fleming who wrote a lot about Washington. When I saw those passages about Washington's temper and how he would just have these fits of anger, I was really surprised. But then it made sense given what I've read about how he would go to great lengths to retrieve enslaved people if they had escaped, so it just kind of fit that theme. Suzy Chase: Are there any known descendants of Hercules? Adrian Miller: No. Only because, well let me just back up. I don't know if anybody has attempted to trace the descendants, because we do know that Hercules left behind some kids and a wife at Mount Vernon. But I don't think anybody's ever really tried to identify their descendants in the ways that people have tried to with Thomas Jefferson's enslaved community. Suzy Chase: So moving on from Hercules, African American cooks had to know how to make the best French cuisine. Even Jefferson's enslaved chef James Hemings was trained in classic French cooking. There was no Julia Child's Mastering the Art of French Cooking cookbook back then. So who taught James Hemings? Adrian Miller: So it's very interesting when Jefferson becomes Minister to France, this was well before his Presidency, he actually brings a teenaged James Hemings with him over to France and he has him apprentice for three years under several accomplished French cooks and that's how James Hemings gets that knowledge. And then once he's done with his training, which was quite extensive, and we have records of Jefferson kind of bemoaning that fact. He installs Hemings as his chef de cuisine at his Paris residence. Not far from I think, I can't remember if it was on the Champs-Elysées, but either very on there or not too far from it. So but what you see through during the Antebellum Period of U.S. history is that a lot of wealthy white families would actually have their enslaved African American cooks apprentice under French chefs because French food was the food of entertaining. And they knew that if they were going to establish their mark as a great host or hostess they needed to have good cooking. Even though they weren't doing the cooking, they needed to have good cooking was there from their kitchen. And so they would often encumber that expense in order to have their enslaved cooks trained. Suzy Chase: Then Hemings was freed and trained the chefs at Monticello and sadly he committed suicide. So only two of his recipes exist today, is that right? Adrian Miller: Yes so far, and as far I know only two of those recipes exist. There maybe some other recipes in some other places and I know that there's some people trying to find all of his recipes. There's an organization called the James Hemings Foundation, which is trying to collect all of this, but as far as I know there's only a couple of recipes existing in his hand. Suzy Chase: And one's for chocolate cream and the other is for snow eggs. What are snow eggs? Adrian Miller: Yeah so snow eggs is kind of a lost dessert, kind of hard to explain because I'm not a trained chef. I've definitely had other people make it, when I'm hosting people. But it's kind of a meringue type desert, I guess is the best way to describe it. It's very light. Very good. Very elegant. So it just shows the skill of this trained chef to pull off that kind of dessert without the modern equipment that we know of today. Suzy Chase: As an aside, James Hemings was Sally Hemings older brother who had a longtime relationship with Thomas Jefferson and he had six kids with her. Adrian Miller: Yeah, so many believe that the forced sexual relationship with Sally Hemings actually started in France because she came over there as a teenage girl with one of Jefferson's daughters. So many believe that, that started happening then and James Hemings would have been very aware of this while he was there because he was apprenticing and cooking at that time. So just a very troubled time for both of them. The interesting thing is people have wondered why they didn't pursue their freedom because similar to that gradual Abolition Act, that Pennsylvania had passed, when the Hemings were in France. France had something a little similar, although a third party had to intercede on their behalf. And some believe they may have used that fact as leverage from Jefferson to get a salary, and to get certain concessions about keeping the family together and other things. Other historians have written about this, but yeah so all of that is in the mix while Hemings is working for Jefferson. Suzy Chase: Do you think Jefferson was the first President who influenced American cuisine especially with the wealthy households? Adrian Miller: I'm not sure about that. I think Jefferson maybe gets more credit than he deserves for some of these things. I mean, he certainly was a foodie, but George Washington was a foodie as well. And people would try to emulate what they served on their tables, but you don't see a lot of records of what Washington served necessarily and you see more about Jefferson. And I think part of it is because some of Jefferson's enemies wanted to highlight the fact that he loved French food. And again it goes back to what we were talking about earlier about trying to cast the President as being maybe aristocratic and not having the common touch. But he certainly loved mac and cheese. He served it in the White House. He was an avid gardener and many would say that towards the end of his life he was really primarily on a vegetarian diet. And had meat more sparingly than anything. So don't have a great answer for that question, but I know that people were paying attention to his table. Suzy Chase: Last Friday as you saw in my Instagram, I made the Baked Macaroni with Cheese recipe on page 90. Now was that James Heming's recipe? Adrian Miller: It likely was something that James Hemings made because we see some elements of French cuisine in that recipe, so I, we don't prescribe it directly to him but I'm almost certain that, that's something he would have made. And I lean on the recipe from Damon Lee Fowler in his book, Dining at Monticello. That's where I got that recipe from. Suzy Chase: It was really bland. Adrian Miller: In fact, the first noted record we have of someone eating Thomas Jefferson's macaroni and cheese recipe, the guy wasn't feeling it either. His name was Representative Manasseh Cutler, he was a Congressman from Massachusetts. And he was a diarist and when he first tasted it he said it was ... He didn't say bland, but he said it was strong and disagreeable. Adrian Miller: ... not the goopy mess that we love today. Suzy Chase: I was really excited to make it. Adrian Miller: I understand. I understand. Suzy Chase: So Lincoln's favorite dish was cabbage and potatoes made by Mary Dines. Tell us about her. Adrian Miller: Yeah, she's a fascinating figure who I actually did not know much about before I dove into the research for this book. So she was a formerly enslaved person who was living in a contraband camp either on the board, in D.C., or quite near it. And so Lincoln went off and passed by this contraband camp as he was traveling to the Old Soldiers' Home where he would take a break from the White House. And while at that home, while in the camp, he heard Mary Dines singing spirituals, and was very moved by the music. And I guess somehow they got to talking or connection was made and he invited her to cook for him while he was staying at the Old Soldiers' Home. So she takes up residence there and she cooks for him, and then eventually she actually gets invited to cook in the White House for certain occasions. So her story was very interesting how she emerged from slavery and was trying to make her own stake in the world and she makes this connection to Lincoln. Suzy Chase: One fascinating tidbit in this book is after the Emancipation Presidents were increasingly dependent on their black cooks for advice on things such as race relations. Tell us a little bit about that. Adrian Miller: So once we emerge from Emancipation, it was a time when Republicans were pretty dominant on the political scene. And a lot of African Americans joined the Republican Party because they just felt they were more committed to their civil rights, and economic advancement, and social progress. So the African Americans become an important constituency. So we see Presidents actually taking the time to pay attention to that constituency. Now sometimes, I should say a lot of the times it was lip service, but we start to see Presidents do things that we may not have noticed before and so advisors start to emerge, and probably the most famous is Frederick Douglass. But there were people like James Wormley and others who whenever they could got the President's ear and tried to press for more advancement for African American people. Now because of the code of silence that surrounds the Presidency especially with the people who work for them, we don't have a lot of accounts of these things, but every once in a while we'll get a memoir, or some newspaper reference, or something about an African American trying to make the case for advancing the status of African Americans in the country. Suzy Chase: As a carryover employee from James Buchanan's Presidency Cornelia Mitchell was the first Presidential cook to run the White House kitchen in post-emancipation America. Adrian Miller: Sometimes the status of the White house cook does not depend wholly on the political fortunes of who they're working for. We often see that the cooks may last for several administrations. And so Cornelia Mitchell was definitely somebody who was adept at making those homemade dishes that Lincoln liked. We don't have a lot of information about what President Buchanan particularly liked, but he, evidently she was good enough for him to recommend her to Lincoln. And so the interesting thing about President Lincoln is, if you look at accounts of meals during his Presidency a lot of the formal public meals were quite elaborate, but when you hear about his private dining Lincoln ate very sparingly. He often picked at his food. Often people surrounding him who loved him had to force him to eat something to sustain his strength. I think that's just the weight of what was going on in our country weighing on him. But those times that he was happy with food it was often the food that invoked his childhood and those simple dishes like cabbage, and corn, and potatoes, and ham, and things like that. I guess he was a big fan of lemon pie as well. Suzy Chase: That's interesting because he was from Illinois right? Suzy Chase: The most celebrated African American Presidential cook of the latter 19th century was Laura Dolly Johnson. Describe her. Adrian Miller: Yeah, so she is what I would call a reluctant White House cook. So she comes on the scene because a young Theodore Roosevelt was traveling in Kentucky and he actually has dinner with a Kentucky Colonial, a guy named John Mason Brown. And Dolly Johnson was Brown's cook, and Roosevelt was so impressed with that meal that when Benjamin Harrison becomes President he actually recommends Dolly Johnson to Harrison. And Harrison reaches out or has some of his people reach out to Johnson and she just says look, "I don't want to cook in the White House. I just want to leave my private cooking job with the Colonial and start a catering business." But there was a lot of arm twisting and eventually she accepts the position. The only problem was that there was a French woman already cooking at the White House as the Head Chef and her name was Madame Petronard. And when she saw the headlines of Dolly Johnson getting hired she actually had a very American response. First she starts bad mouthing the Harrison's food habits, chief among their sins was eating pie for breakfast. And then she filed a lawsuit, this is the first example we know of, of a White House employee actually suing the President. Adrian Miller: Everything got ... Yeah. I haven't been able to find out how everything shook out, but obviously it was resolved because it never went to court. But she leaves, Dolly Johnson gets installed as the cook but she only stays there for about six months because her daughter is sick, so she returns back to Lexington Kentucky to care for her daughter. But then when Grover Cleveland becomes President, which was four years later, he actually begs her to come cook in the White house kitchen and she accepts and ends up cooking there. She's one of the few examples we have of an African American White House cook trading on their notoriety after they leave the White House. In my book I show a newspaper ad of the restaurant that she ran in Lexington. And the last we really hear of her in any major sense is that when Alice Roosevelt married Nicholas Longworth, and Alice Roosevelt was the daughter of Theodore Roosevelt, we have Dolly Johnson sending her a pecan pie. I'm sorry, a Pecan cake, which evidently Alice Longworth really loved and that's the last we hear of her. Suzy Chase: In the book there's a photo of Dolly Johnson in the White House kitchen and it looked so dark, and I read that the critters were hard to keep out of the kitchen too. Adrian Miller: Yeah, I don't know if you've heard the recent reports that the White House is overrun with mice and other things. But you know the White House was built on a reclaimed swamp. So having critters around and keeping them out is a full time job. But at that time it was just so bad that Caroline Harrison actually started a campaign to have the White House physically moved to another part of D.C. She just could not deal with it. But yeah, it is a dark looking picture. That's the earliest picture we have of the White House kitchen and interestingly enough, the White House kitchen was moved to that spot by Mary Todd Lincoln in order to get more light into the kitchen. Suzy Chase: Yeah I was happy to see there was a window or two. Adrian Miller: Mm-hmm (affirmative). Yeah, when you look at the ... There must have been remodeling or something because when you look at the White House kitchen by the time of Theodore Roosevelt it seems very well lit, by that time. But even today, when you go to the White House kitchen it's pretty much, there's no widows around really in the current one, so thankfully there's electricity to light the way. Suzy Chase: So Daisy Bonner and Lizzie McDuffie loved Franklin Delano Roosevelt and he loved them. What made them a special team? Adrian Miller: I think part of it is that they really cared about the food they were serving to him and they took pride in it, which is not the case back at the White House, at least for some of the culinary team. So First Ladies were usually the ones that took charge of the food service for the President, planning menus just making sure everything was right. Making sure all the dietary restrictions were met and so on. But Eleanor Roosevelt was fundamentally uninterested in food. She was a very cerebral person. She wanted to be in policy and out there advocating for things, so she delegated the food preparation and all of that to a woman named Henrietta Nesbitt who is somebody that she met while Roosevelt was Governor of New York. And they were in the League of Women Voters together, and she just admired Nesbitt's pluck in running a bakery while her husband was unemployed. So she gets involved but evidently Nesbitt wasn't the greatest cook, and even though there was a team of African American cooks preparing the President's food, Nesbitt would come and stand behind them and correct what they did and essentially just messed up the food they were getting. So Roosevelt was pretty miserable when it came to the cuisine he ate in the White House and he would often loudly complain about it. And I think rationing had an effect on what kind of food he got as well. So when he went to Warm Springs Georgia, Daisy Bonner and Lizzie McDuffie would make sure he would get the finest Southern food and really tasty stuff, so I think he really looked forward to it. And so often he was on a diet and was prescribed certain things to eat, so Lizzie McDuffie and Daisy Bonner would make those prescribed dishes and they would look at the President and if they felt he looked peaked as they called it they would as they were serving him the prescribed dish, they would just whisper in his ear, "Don't eat that." And he would act like he wasn't hungry and would just pick at his food. And when everybody would cleared out they'd take him back to the kitchen to hook him up with what he really wanted. Adrian Miller: He loved pig's feet. Yes, he loved pig's feet. And he loved the way that Daisy Bonner made them, which was she would broil, split them, broil them, butter them. Suzy Chase: Oh, my God. Adrian Miller: And he actually ... I know. He actually loved them so much that he served sweet and sour pig's feet to Winston Churchill in the White House. Churchill was not feeling the pig's feet. Suzy Chase: How did he describe them? Adrian Miller: When FDR asked him about it, he said, "They're kind of slimy, and they have an interesting texture." And then FDR said," Oh, okay. Well next time we'll have them fried." And then I guess Churchill's face just said it all. He just said, "I just don't think I'd want them fried." Suzy Chase: Yeah, I'll bet. Adrian Miller: And they started laughing. They started laughing. Suzy Chase: Is it true that President Eisenhower liked to help make his beef stew? Adrian Miller: Oh yeah, Eisenhower was probably the cook, the President who loved to cook the most. So he had this favorite beef stew that he made, it had a lot of vegetables in it. And he was quite famous for this stew. In fact, during the 1956 election the Republican National Committee released a bunch of recipe cards of this stew. And they encouraged housewives to have stew suppers across the country where they would essentially make the stew and invite their neighbors over and talk about Eisenhower, which I think is kind of brilliant. But he made this stew and he was also known for grilling. In fact, he had a grill installed on the roof top of the White House. So imagine you're walking down 1600 Pennsylvania Avenue and you see smoke coming out of the White House? Well it's the President up there grilling. Suzy Chase: Just an average day. Suzy Chase: Do you think Ike and Mamie advanced civil rights during their Administration? Adrian Miller: To some extent because the Civil Rights Movement was really gaining momentum during the Presidency. We remember the Little Rock nine, the bus boycott in Montgomery Alabama. There was a lot of significant events happening. Now of course, it was never enough for a lot of people, but there were some things of progress made. And Eisenhower was really the first President to have an African American in his cabinet. A guy named Victor Morrow who worked there. So there was some slight gains, and I think it set the stage for the 60's. But I don't, of course I don't think there was enough because I wanted African Americans full participation in society and they didn't really see a major step for them until the 1960's, but there's been more and more debate about what Eisenhower did during those times to help advance civil rights. And there are quite a few scholars who say that Eisenhower should maybe get more credit for what he did in those times, again under those circumstances. Suzy Chase: LBJ was the last President to bring a lifetime African American personal cook to serve on the White House kitchen staff, and her name was Zephyr Black Wright. What an interesting figure she was. Adrian Miller: Yeah Zephyr Wright is probably the most fascinating person that I encountered during my research. And she's the one person, if I could just pick one person to have dinner with, I think it would be her because of her point in history, and her personality just comes through and I just think it would be fun to talk to her. I could just see us laughing and sharing a lot of Southern food. But she was a longtime cook for the Johnson's, they hired her in the early 1940's and bring her to Washington. And many attribute her cooking to the reason why Johnson was able to rise rapidly in Congress. So I'm about to tell you something that's gonna sound like a fairy tale. But back in the '40's and '50's, members of Congress would have each over at their house for dinner. Adrian Miller: And they would be collegial, yeah they would be collegial. Suzy Chase: Wow, that's shocking. Adrian Miller: I know. And so very few people turned down an invitation to the Johnson's because they knew they were going to get Zephyr Wright, Zephyr Wright's food. But she's also in a way a civil right's advocate besides being a great cook. In addition to being a great cook, because during the drives back and forth from the ranch in Central Texas where the Johnsons lived to D.C. they would drive through this integrated South and Zephyr Wright suffered so many indignities that she eventually refused to make the trip. And so she would just stay in D.C. year round. So when Johnson becomes President and he's advocating for the 1964 Civil Rights Act, he actually used Zephyr Wright's Jim Crow experiences to persuade members of Congress to support the legislation and when he signed it into law, he gave her one of the pens and said, "You deserve this as much as anyone else." Suzy Chase: It was interesting to read that while the job was taking a toll on her health, she still had to make low fat meals. Adrian Miller: So as a Senator, Lyndon Johnson had a pretty massive heart attack and so he was on a forced diet. He didn't stick with the diet all the time. But Zephyr Wright was really in charge of keeping him happy and healthy, but making delectable food. And there's one funny exchange where she wrote a note to the President basically saying that you're going to eat what I put in front of you and you're not going to complain. And Johnson happily carried that note around and would show it to people just to prove that he wasn't becoming too arrogant because his cook was talking to him like that. But she says towards the end of her career in the White House she said that she was thinking about writing a low fat cook book, but it never comes to fruition and I just thought that would have been amazing. That time was in the late '50s to write a low fat cook book, that would have been awesome. But it just never happened. Suzy Chase: Tell us how Jackie O changed the cuisine in the White House. Adrian Miller: By the time Jacqueline Kennedy gets to the White House in 1961, she was not impressed with White House food. And she wanted it to become more elegant to take on a more French accent. So she fired the Filipino cook who was working there during the Eisenhower Administration, a guy named Pedro Udo who was essentially a military cook, I believe. And she hires René Verdon a French chef, she christened the head cook position White House Executive Chef, because before that it was just head cook, first cook, White House cook, they didn't say Executive Chef. And so menus started being appearing in French and other things. So there was push back on the French menus, so they eventually were Fonglay a mix of French and English and then eventually all English. But it takes a different turn, and so by emphasizing European cooking by European trained chefs, Jackie Kennedy I not, I wouldn't say intentionally, but undercuts the presence of African Americans in the White House kitchen because they don't have that training. And I don't think it was racism, I think it's just more about elitism than anything and just preferred tastes. But we see the presence of African Americans wane from that point in the kitchen, to the point now where there are few African Americans in the White House kitchen as assistant chefs. But there has not been an Executive Chef except for a short time when Zephyr Wright runs the White House kitchen in between hiring a different Executive Chef. We just haven't had one since. Suzy Chase: So in closing can you briefly describe the cuisines of the Bush's, Clinton's and Obama's? Adrian Miller: So I would call the Clinton's, well also let's start with George W Bush. In the public sphere it was French cooking and it was kind of almost rote French cooking. There was actually articles saying, "Hey, can we have something different for these state dinners?" It was like the same old French dishes. But the Bush's cooking, George H.W. Bush I would say was more of a New England feel. You know the Kennebunkport Maine, if I'm pronouncing that correctly. Adrian Miller: Let's just say with George H.W. Bush, it was more the cooking of Maine and New England, with some maybe Texas accents here and there. With the Clinton's you've got a mix of Southern food as maybe the foundational cuisine, but Hillary Clinton did a lot to celebrate American regional cooking. And I think the cooking that there's to this day is really a reflection of what she did to move White House cooking in the food persona from French to more American. And then when we get to the George W. Bush definitely Texas was celebrated in the food served in the White House. But still just continuing the celebration of American regional cuisine. And then we definitely see that with the Obama's, especially in the State Dinners. A lot of the approach was to celebrate American Regional foods, but to have a shout-out to the host, the visiting country, you know have a shout-out to the favorite profiles that they were used to in maybe the side dishes or other things. And then in the current White House we don't get a lot of information about what's being served, but I would assume it's a fairly a continuation of what was in the Obama White House only because the White House Executive Chef Cristeta Comerford still works as the Executive Chef under the Trump Administration, and she's been cooking there since the George, the second term of George W. Bush. Suzy Chase: One final thing I'm dying to know and I hope you know the answer. Okay, so you know when Presidents go out to dinner at a restaurant, is there really a guy who tastes everything before it is sent out to him? Adrian Miller: There is a trained chef on the Secret Service who actually observes everything that is being prepared for the President, to make sure that it's not poisoned and that it's safe. So there's somebody watching the food being prepared. And so the chef is usually the last person to taste the food before it actually goes to the President. Adrian Miller: Yeah, you know you hear about elimination challenges on TV, but to me that's an elimination challenge. Suzy Chase: That's the ultimate elimination challenge. Adrian Miller: Yeah, to have an armed Secret Service person watching everything you do. So I try to make it easy for people. Now in terms of the President book I do have a separate website for that which is blackchefswhitehouse.com. Suzy Chase: Everyone needs to give this book as a gift this holiday season and I hope, hope, hope, that you win the NAACP image award for this very important book. Thank you so much Adrian for coming on Cookery by the Book podcast. 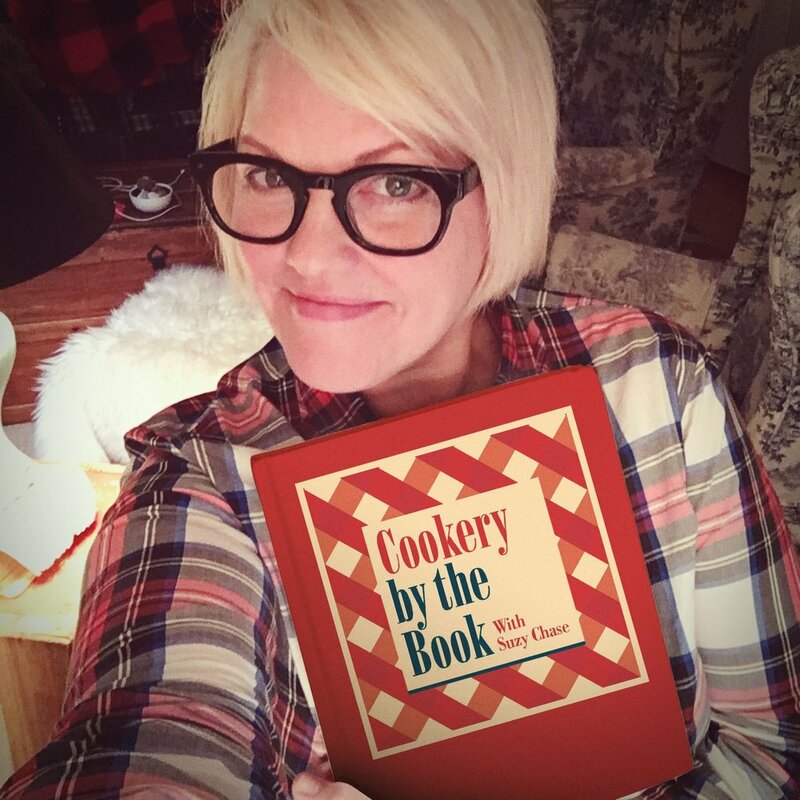 Suzy Chase: Follow me on Instagram at Cookery by the Book, Twitter's I am Suzy Chase. And download your kitchen mix tapes music to cook by on Spotify at Cookery by the Book and as always subscribe in Apple Podcasts.